What is the difference between an “OPEN EDITION” and “LIMITED EDITION” Print? Open Edition prints are available to collectors in an unlimited number. A Limited Edition is hand-signed and numbered by the photographer in the form ##/## (eg. 4/12). The first number is the number of the print itself. The second number is the quantity of overall prints the artist will produce of that image. Unless otherwise noted, ALL my prints are Open Edition for a few reasons. First, I am not a famous photographer; and second, I want my photography to be more affordable and on the walls of more clients. Most of my images will probably never be changed. However, I do reserve the right to make improvements to an image when future technology advances (eg. post processing software/techniques). For these reasons, I’ve chosen Open Edition prints for purchase, with each image being signed and titled. Bill Marson photography highly recommends this method of printing. In fact, this is the medium I choose for displaying my work in my home. 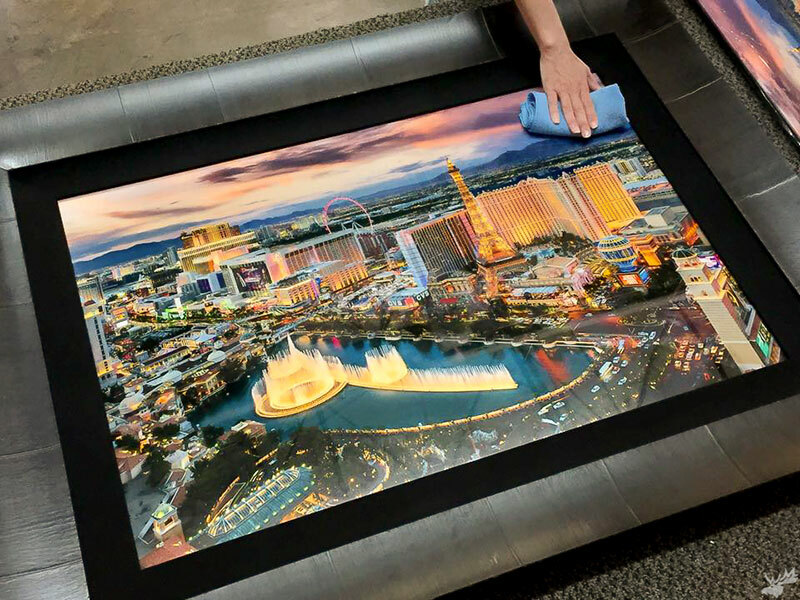 This method of printing brings unbelievable resolution, clarity, and vibrancy with an incredible 3D image quality to your photo that can appear backlit and holographic. 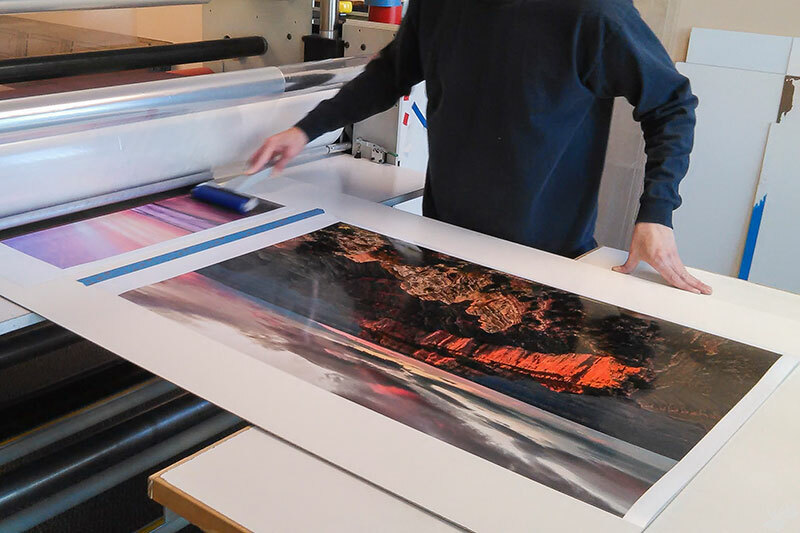 This industry leading, gallery quality printing process begins by producing a photographic print that is then face mounted from behind to a sheet of crystal clear acrylic glass. Details appear to emerge in 3D from the depths of the image with the Lumachrome process thanks to the transparency layer that is infused with iridium particles and is encapsulated in a layer suspended between the white poly surface and Acrylic. Your Acrylic print is delivered ready to hang with a recessed back-mounted ‘Roma’ frame which floats the print 1.3″ off the wall for a clean contemporary look. The final result is simply beautiful that will generate many a “Wow!” reaction. For those who desire the ultimate in gallery quality fine art photographic presentation today, I offer my Lumachrome Open Edition pieces coupled with incredible ROMA Tabacchino 4" Dark Ash Framing and a 3" Linen Liner. Please contact me for more information. The print only option is the most affordable route to go. It is just what it sounds like: prints on high quality archival photographic paper without any mounting or framing. 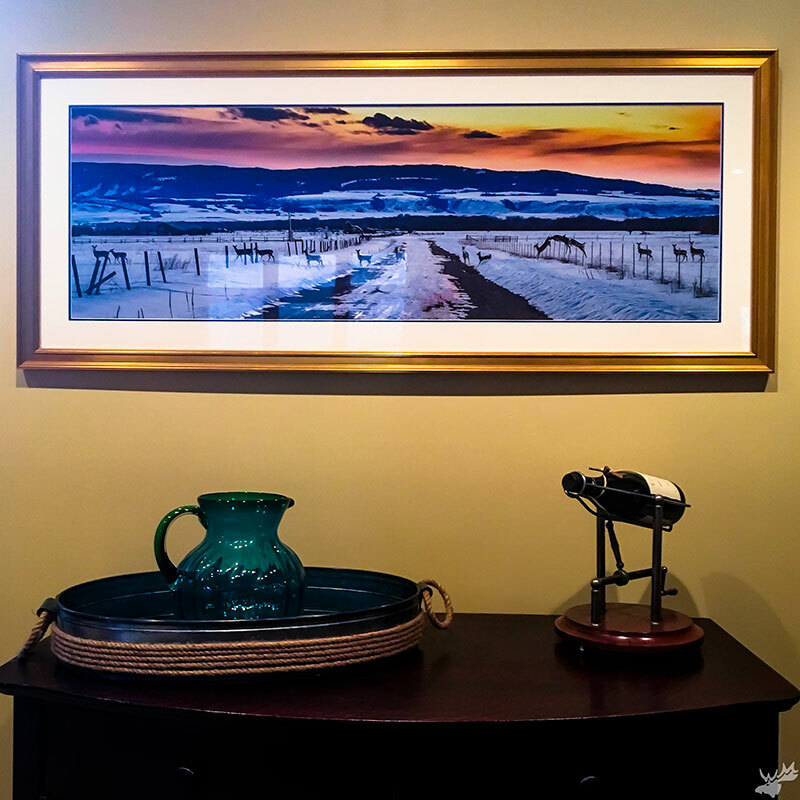 One of the benefits of going this route is that you can bring them to your local frame shop to have the matted and framed exactly as you like. Prints usually arrive in 1-2 weeks from the time of order. Every purchased Open Edition print will be accompanied by a Certificate of Authenticity (CoA) which includes the date the photo was created, location of the photo, a serialized holographic authenticity label, and my signature. On the back of the print is a matching holographic authenticity label. These items together certify that your photographic print is an authentic work. 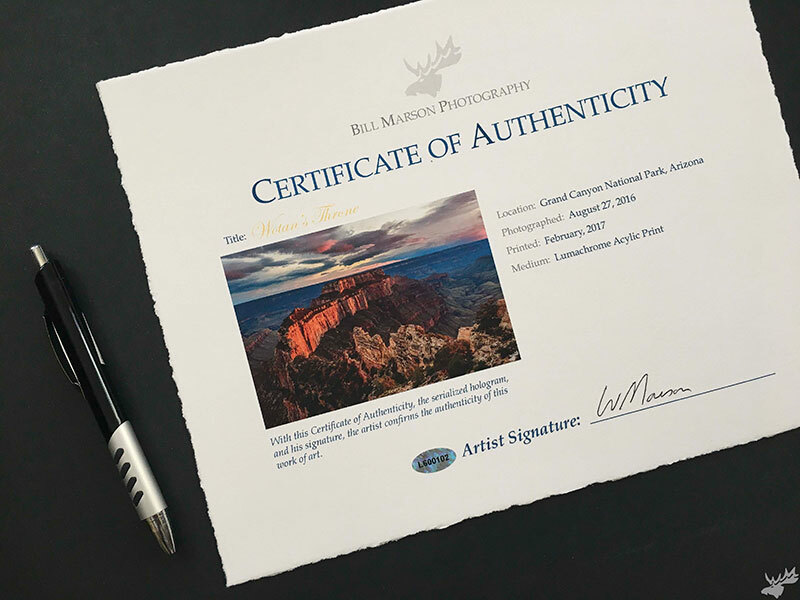 Certificates of Authenticity are printed on Hahnemuhle Photo Rag, Deckle Edge Paper. All payments on this website are processed automatically via PayPal. PayPal is The World’s Most-loved Way To Pay And Get Paid. PayPal uses the latest in data encryption and anti-fraud technology to keep your information secure, reducing the risk of online fraud. You can use any credit or debit card to pay via PayPal and can even make payments if you do not have an account. All print only orders are currently shipped free within the U.S. and Canada. Hand delivery or pick-up is available in the Phoenix, Arizona metropolitan area. Typical fulfillment times are 2-4 weeks, but can vary during the time of year. Bill Marson Photography is based in Chandler, Arizona. All orders shipped within the state of Arizona will be charged a 7.8% sales tax. Out-of-state sales taxes will be calculated and added to the final purchase price once your order is placed. I am so confident that you will be pleased with the quality of your investment that I offer a full “100% Satisfaction Guaranteed” policy on all prints sold. If you are not completely satisfied with your purchase, simply return it undamaged within a week of receipt. A full refund (not including postage) will be sent to you after quality control inspection.